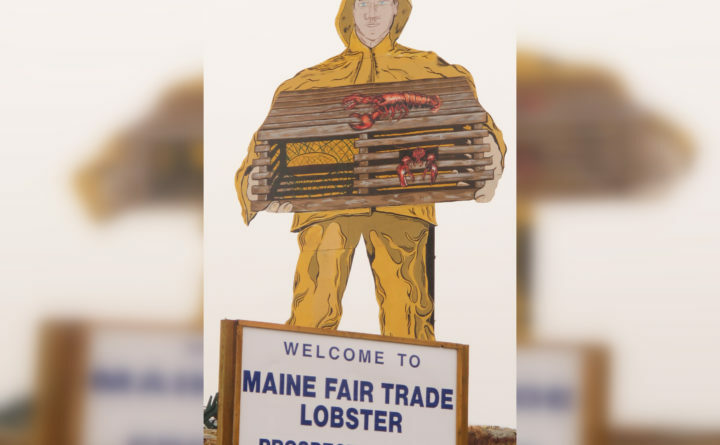 A large metal fisherman holds a lobster trap stands outside the Maine Fair Trade Lobster plant in the Gouldsboro village of Prospect Harbor in this May 2014 file photo. The district attorney for Hancock County says he will not file charges against a Gouldsboro lobster processor where an animal welfare group shot a hidden-camera video. People for the Ethical Treatment of Animals claimed that the video it recorded Oct. 1, 2018 inside the plant shows workers treating lobster inhumanely. In a statement released Friday afternoon, Matthew Foster said there is a lack of conclusive evidence that lobsters are “sentient,” and noted that a similar complaint filed in 2013 in Knox County was not prosecuted either. In the Knox County case, involving a Rockland plant owned by Linda Bean, then-District Attorney Geoffrey Rushlau concluded that it was not clear that the Legislature intended lobsters to be included in the definition of “animals” cited by the state’s cruelty to animals statute. “[My] position in this case is that the same analysis applies,” Foster said. He added that lobster processing facilities in Maine are regulated by the state Department of Marine Resources and the Department of Agriculture, Conservation and Forestry, and that neither agency has cited any deficiencies or concerns in the operation of the Gouldsboro plant. In a separate release Friday, PETA said Foster was “wrong” not to file charges against the company. In a six-page letter PETA sent last month to Foster, it calls the handling of lobster seen in the video “unjustifiable” and adds that Richmond-based Shucks Maine Lobster, Whole Foods in Portland and the planned Ready Seafood expansion in Saco all either already use or will use more humane killing methods that involve high-pressure water or electric stunning systems. Some overseas authorities have concluded lobsters can feel pain and some countries have banned boiling them alive, according to the group. Foster said he takes animal cruelty “very seriously” and prosecutes offenders to the fullest extent of the law.